Explore Jeld Wen premium vinyl windows reviews, costs, ratings and warranty information on this replacement vinyl window. Jeld Wen is probably best known for their doors, although they're quite a large company and do offer a number of different windows that include the Premium Vinyl Series. The company has a bit of a mixed reputation when it comes to their vinyl options, with some contractors complementary of their vinyl windows, while others feel like it is a mid range product at best. The Jeld Wen Premium Vinyl window (the v4500 series) is the upgraded Builders Vinyl and is a decent vinyl window, but not one of the best options out there. The Premium Vinyl window can be ordered as a bay or below, sliding patio door, radius are geometric shapes, fixed frame, horizontal slider, double hung, single hung, casement or awning. It is available in 8 exterior color finishes, from French vanilla to Mesa read. The hardware, which is called a mag lock, seems a little cheap and flimsy. Homeowners can expect the window replacement price of the Premium Vinyl model to run roughly $45 to $60 per square foot fully installed. The Premium Model will cost 15% to 30% over the price of the Jeld Wen Builders Vinyl. Comparable to the Pella 350 Series and Silverline 8500 windows. The Jeld Wen Premium Vinyl window includes a limited lifetime warranty on the frame and sash. It includes a two-year provision that covers the labor portion of any replacement or repair. 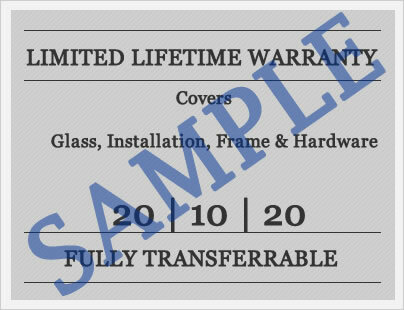 Their vinyl window warranty is transferable for 10 years from the time of the original purchase. It also includes a 10 year provision on exterior frame colors and finishes. As with all warranties, homeowners should read the limitations and exclusions to fully understand what is covered and what isn't. Do you have a question about the Jeld Wen Premium Vinyl? Our industry professionals can help you get more information on pricing, upgrades, installation requirements, installation quotes, as well as help you sort through the quotes and companies you are considering for your next window replacement project. Want to add your Jeld Wen Premium Vinyl windows reviews? Post it here and help other consumers get the information they need to make the right choice for their home.